to get the full magazine. 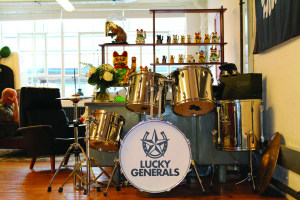 At 100 people, London-based Lucky Generals would be considered a large agency in Sydney. But in London, with M&C Saatchi and Ogilvy upwards of 400 staff, it’s one of the smaller shops in town. It’s only four years old but it’s already scored work for some big brands, from Amazon to Betfair and Twitter. Earlier this year the agency sold a 60% stake to TBWA, cementing its position as a serious contender on the London scene. The office, located in the gastronomic centre of Clerkenwell, perches above one of the city’s busy street markets. It’s open plan, with the workspace bleeding into the kitchen area. People congregate in busy clusters and it takes a non-traditional approach to meeting spaces. Nairn founded Lucky Generals alongside Helen Calcraft and Danny Brooke-Taylor. After spending more than 20 years in network agencies, and meeting at London creative agency MCBD, the trio built the agency out of frustration and the need to move faster. Their first piece of work was for Irish betting company Paddy Power, which boldly addressed homophobia in soccer by creating rainbow laces for players to wear. “We created an entire company on the basis of those rainbow coloured bootlaces,” Nairn said. “As an agency you are defined by your first client, so if your first client is a boring old bank, that’s the type of work you’re associated with. Whereas we had these crazy Irish bookmakers wanting to do a mad guerilla campaign. It set us off on a certain course,” Nairn said. Another defining moment for the agency was when it became Amazon’s first UK agency at just 15 months old. The Amazon team introduced Lucky Generals to the Jeff Bezos “two pizza” rule; if you can’t feed your team on two pizzas then the team is too big and you should break them up. “We thought it was sort of ridiculous that this enormous company were actively trying to find a really small team that they could have a personal relationship with,” Nairn said. Another “rule” the agency introduced is its motto: ‘Or die trying’. “When we first started we had Post-It notes on the wall of what we wanted to achieve. We took them off one-by-one as they became less important. We ended up with one that just said ‘Or die trying’. In other words, we asked ourselves what’s the worst that could happen? If it all goes disastrously wrong and we are bankrupt within six months, it’ll be embarrassing but we aren’t unemployable. ‘Or die trying’ is our fearlessness,” Nairn said. Now a part of the Omnicom Group, Nairn remains adamant Lucky Generals will remain its own agency – despite reports it would be folded into TBWA/London. “It was misreported that we were entering a merger with TBWA/London, because Omnicom had done a similar thing with DDB London and Adam & Eve,” Nairn said. 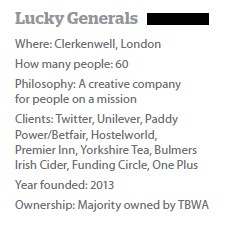 Instead, Omnicom plans to use Lucky Generals’ status to resuscitate TBWA/London, which is a fraction of the size it could be. Like with Omnicom’s 2014 acquisition of HEIMAT in Germany, Nairn said the two agencies would work together to create a “halo effect”. “The idea is to keep the agencies as totally separate brands, but help TBWA/London hire new leadership and once we have helped build their team, we will continue to help along the way,” he said. In July, TBWA London revealed its new leadership, scooping Saatchi & Saatchi execs Andy Jex as chief creative officer and Anna Vogt as chief strategy officer. This month, TBWA London also hired former Mother boss Sara Tate as CEO. The hires were led by the Lucky Generals founders. Nairn refers to the partnership as Omnicom’s “two brand strategy”, adding Lucky Generals is acting as the agency’s “match maker” to attract talent that TBWA/London hasn’t been able to. When the trio went out on their own, Nairn said he and his cofounders received an overwhelming amount of well-wishes from rivals – a rare occurrence in the Australian market. While ‘tall poppy syndrome’ may not have made the 24-hour flight to London just yet, a lot of the industry challenges remain the same: shrinking budgets, over supply of agencies and the persistent pitch process. Growth is on the horizon for Lucky Generals, now it’s backed by TBWA, and the co-founders are looking to take the brand global. Nairn wouldn’t rule out the possibility of opening an Australian arm, adding he will be closely watching how 72andSunny fair in the market. Read more about the European market and how it compares to Australia here. Also check out the profile on 72andSunny Amsterdam. 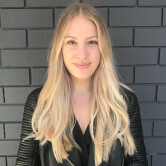 On a recent trip through Europe, AdNews journalist Lindsay Bennett called into some of the continent’s most vibrant ad agencies in London, Berlin and Amsterdam to see how their culture influences their work. This is a free article from our 'AdNews takes Europe' cover feature in the October issue of AdNews. Subscribe to get the full magazine.